St. Patrick's Day dawned early in our house. Very early. Shortly after midnight, in fact. Finn woke up with a stomach bug that kept him up every hour or so until the alarm went off, at which point he slept for 3 solid hours, of course. Obviously he wasn't going to make it to school today, but I had my doubts that we would have much of a St. Patrick's Day to celebrate. But when Finn finally made his appearance this morning, he was all smiles and bedhead, and he wanted to know what fun things we were going to do on his "home day". 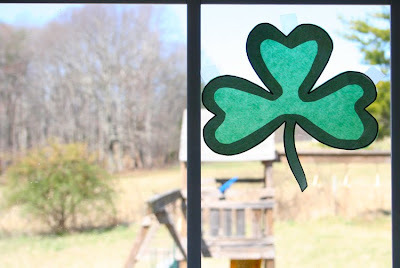 We began the morning with a shamrock suncatcher, which I've seen a few places but don't remember exactly where. We printed a shamrock coloring sheet and cut it out, then cut out the center within 1/2 inch of the outer line. After we had a shamrock outline, we glued kite paper to the outline and trimmed the kite paper to match the edge of the shamrock. 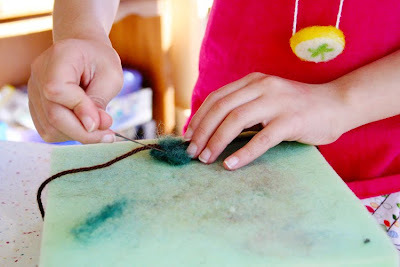 A quick and easy suncatcher! Finn, as usual, wanted a coloring sheet or two, printed for his coloring pleasure. 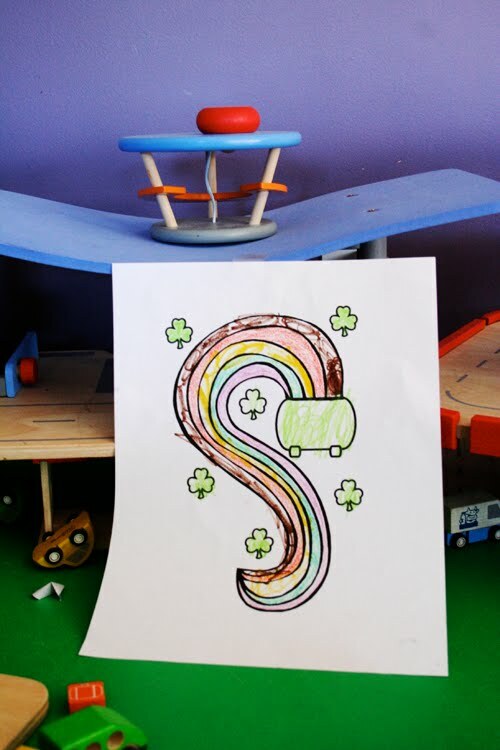 We found a rainbow and shamrock one for him today, in keeping with our theme. Then he wanted a Christmas tree to color in addition to his St. Patty's day coloring sheet. I thought, well, at least it's still green. But, in true Finn fashion, he colored it orange. 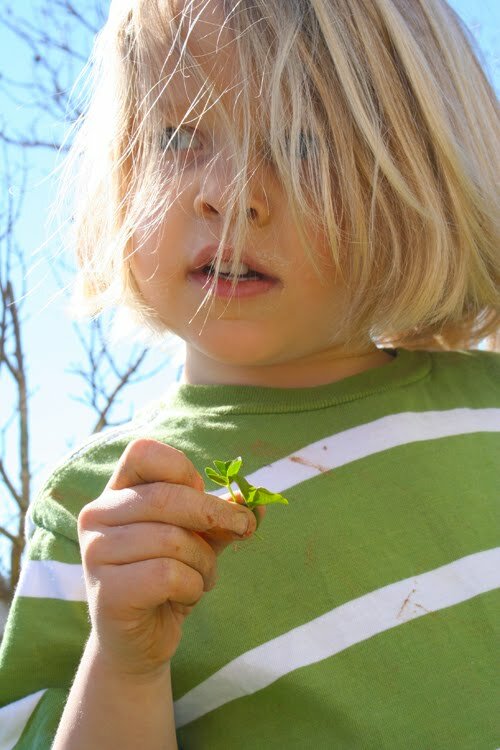 We spent a few minutes searching for 4 leaf clovers, which Finn bored of quickly. He did enjoy picking a few clover for crayon rubbings though. 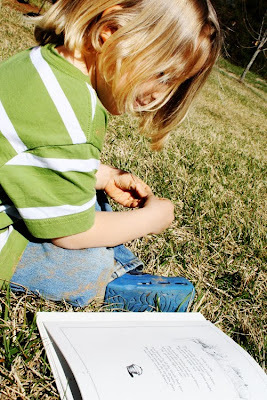 After our clover crayon rubbing, and enjoying the sunny warmth outside, we decided to lounge in the grass for our poetry reading time. Ah, the arrival of spring! 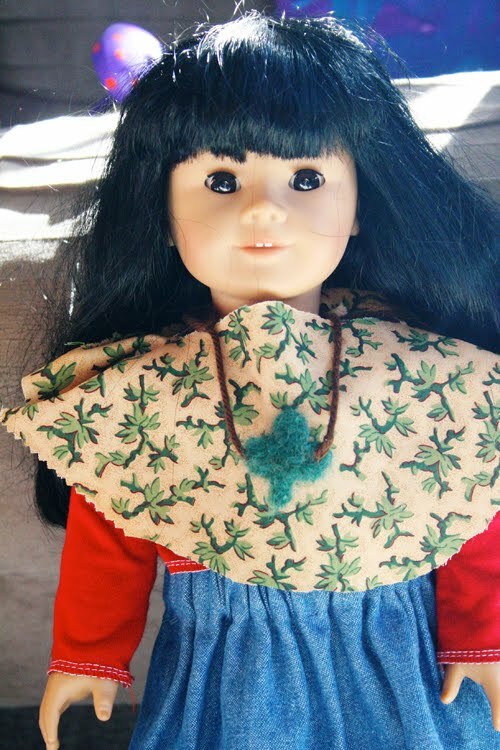 When Elizabeth got home from school, she decided to make a shamrock necklace for her doll similar to the one I made for her a few years ago. In an extension of our conversation from yesterday, I'll admit that while I was still able to get my crafting mojo going on only 4 hours sleep, we had takeout sushi for dinner. Sushi...on St. Patrick's Day. Maybe the vegetarian Guinness stew and Irish soda bread will work out better next year. We had sushi on the first night of Hanukkah last year. Sushi is international happy food. We drank Guinness - unsure of what Saint Patrick would think of this - ate vegetarian sausages & ate mash potato. Dazla also made nigella lawson's guinness cake. The cake resembles the top of a guinness beer & has a whole stout in it. Again many apologies Patrick!